Shopping is such a stress-reliever, don't you agree? I myself spend time to shop once in a while as a therapy after a long work week. At times though it becomes tiring and hassle to leave the house and go to a mall to buy just one or two items. Thankfully, online shops like ZALORA has continuously been improving its inventory to suit various styles and personalities. 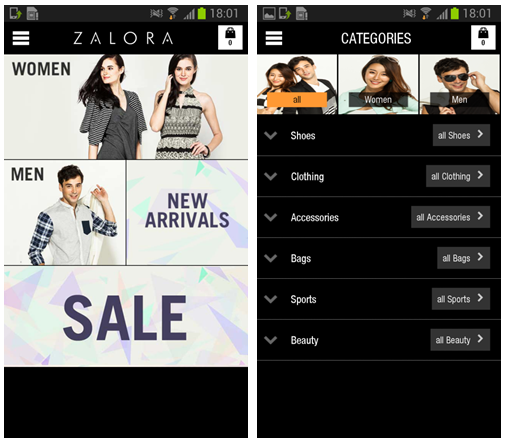 ZALORA, South-East Asia’s fastest-growing fashion and beauty e-tailer, announced the further expansion of its mobile repertoire with the launch of its Android shopping app across the region (http://www.zalora.ph/mobile-apps/). This launch follows the successful launch of the ZALORA iPhone shopping app three months ago, which within 24 hours, became the #1 lifestyle app in the iTunes stores of all ZALORA countries, and the #1 overall app in Singapore, Malaysia and Vietnam. In addition to these shopping features, the ZALORA Android app also provides a richer mobile shopping experience – It uses the built-in capabilities of Android OS to create engaging native animations such as with the ‘add-to-cart’ action. The app also manages to cater to all ZALORA markets despite each e-store’s localized ZALORA product collections, by routing shoppers to the fashion and beauty catalog for their respective locations. An online shopping destination with endless fashion possibilities, ZALORA Philippines indulges every taste and preference on its convenient e-commerce platform with a thirty-day free returns policy, speedy deliveries within 2-3 working days, free delivery available, and multiple payment methods including cash-on-delivery. Check out www.zalora.com.ph for more information.